Happy Monday! My apologizes for missing a few days in our 13 Days of Halloween! A quick trip to Hilton Head Island, SC (post to come) with limited WiFi threw my days off. So, to catch up I will post not one, but two days for our 13 Days of Halloween! One of my favorite Halloween family memories was decorating pumpkins, and to top off this year, what little girl doesn’t want a decorated Else pumpkin from the movie, Frozen? Hope you enjoy day 5! 1. Lightly Spray pumpkin with glitter blast. Let each coat dry completely before adding another coat. 2. 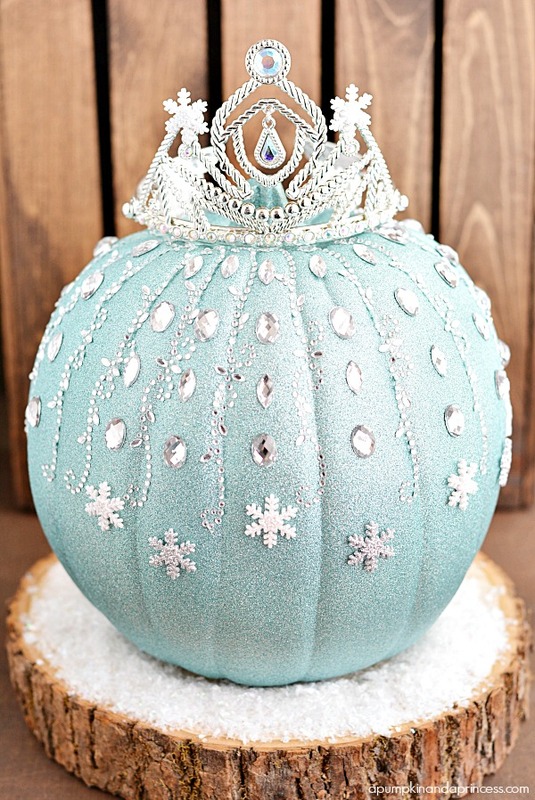 Decorate pumpkin with rhinestones, rhinestone tape, and snowflakes anyway you like.